10:00PM UPDATE: Storm Prediction Center has once again moved the MODERATE risk south and away from the Memphis area. We'll just have to see how this one plays out. Any strong weather should be between 1am and 6am and would likely be in the form of hail or a damaging wind gust, with tornadoes a minimal threat. The Storm Prediction Center has modified the risk of severe weather for the Mid-South for tonight (see above graphic) and now includes all of north MS under a MODERATE RISK, right up to the TN state line. The SLIGHT RISK now encompasses most of west TN. This is in response to the flip-flopping computer models now bringing the aforementioned warm sector closer to the metro area tonight as the stronger low appears as though it will track across Arkansas. The greatest threat will be after midnight through about 6am Saturday. With this situation as dynamic as it has been, any slight shift could have big effects on the resulting weather scenario. Be advised that the possibility of severe weather does exist, including the low threat of tornadoes, overnight and be prepared should it occur. NOAA Weather Radios should be programmed and in working order. There is also still time to sign up for severe weather warnings by email (even to your PDA) with WXLIVE! Severe Weather - you'll get the warning as soon as the National Weather Service issues it. MWN StormView Radar will have the most recent radar imagery throughout the night. Those of us thousands of miles away may not pay much attention to a volcano in Alaska, but Mt. Redoubt is not playing around with the folks southwest of Anchorage. Since last weekend, Redoubt has erupted numerous times, at least a handful of these eruptions have spewed ash and steam 50,000 feet or higher into the sky. The latest eruption occurred at 11:40am CDT today (8:40am Alaksa DT) with the ash going up to 50,000 feet once again. NWS Doppler radar captured this eruption, which I have linked above. Notice the spot just left of the image center as it loops and you'll see the higher reflectivities (brighter colors) appear in a circular fashion - that's Redoubt blowing her top! Ash suspended below 30,000 feet is staying west of Anchorage (located northeast of the volcano and just above and right of the image center), but above 30,000 feet, the ash is spreading towards Anchorage, disrupting air travel significantly. If any of that ash gets in a jet engine, you've got real trouble. The last major eruption sequence for Redoubt was 20 years ago at it lasted for 5 months! It will be interesting to see how long this keeps up this time. For more on Redoubt's activity, visit this exceptional link to the Alaska Volcano Observatory's Mt. Redoubt page. I've spent a fair amount of time talking about the potential for upcoming severe weather tonight and now there seems to be a fairly good consensus coming together... which is favorable for the metro. As seen in the above graphic, the greatest threat of severe weather, including tornadoes, appears to be focused to our south. The low pressure of concern does appear as though it will take a more southerly track, keeping the warm sector to our south, and with it the biggest threat of severe weather. I still expect that we weill see a pretty healthy round of rain and thunderstorms tonight, likely around and after midnight though. Some small hail or a brief high wind gust is possible in our area, but the bad stuff should stay south. Look for the possibility of another inch of rain though and with the ground already saturated, it won't take that much to produce ponding or flooding of low-lying areas, underpasses, and other low points in the road. If you will be out tonight, remember the NWS mantra in flash flooding scenarios: "Turn Around, Don't Drown"! It doesn't take more than a few inches of water to float a car. Scattered showers will stay with us Saturday, especially afternoon, as an upper level low passes overhead. The low will bring not only a few showers, but falling temps (into the 40s by evening) and windy conditions as well. Sunday looks much more pleasant, though coolish and breezy. A couple of shots at rain will appear again next week with near normal temps overall. There is still some disagreement among various sources, including the various computer models, on the exact threat that the Memphis area faces for late Friday. One train of thought has the low pressure system moving by to our northwest, while the other has it just to our southeast. It doesn't seem like much, but it is significant for the resulting severe weather threat for the area. Above is the risk outlook from the Storm Prediction Center and they are on board for a more northwesterly track of the low, which would put the metro area in the warm sector of the storm and at a higher risk for severe weather, including tornadoes. They place us on the edge of a MODERATE RISK for severe weather, which is fairly significant. Areas to our south and southwest would be under a slightly greater threat. The local Memphis NWS office and one of the better computer models actually forecast the primary low to travel over north MS. If this were to occur, we would still be under the gun for possible severe weather, but we would not make it into the storm's warm sector as the warm front would lay across north MS and the threat would be diminished, particularly for tornadoes. However, our friends in north MS may not be quite so fortunate. The greatest threat for tornadoes will likely be very near and just south of the warm front. Given all of this, overnight thunderstorms and the exact development and track of the system will determine what our risk will be. At this time, it is prudent to plan for the likelihood of some form of severe weather during the evening and overnight hours Friday night. I'll post another update on Friday, hopefully as things become more clear. MWN provides several resources to keep you firmly on top of the situation, including this blog, the MWN Forecast, WXLIVE! Severe Weather (email notifications immediately when watches or warnings are issued), MWN StormView Radar, maps like the one above, and of course the expertise of a dedicated weather professional running the show! Stay tuned and be safe. But before I get to that, let's touch briefly on the forecast for the next 48. Looks like we are in a pattern of dry days and rainy nights, beginning last night as a potent system brought over 2" of rain to much of the metro area. I enjoyed sitting out on my screened patio after dark and listening to it hit the roof. It really came down in buckets at times! My reading provided to CoCoRaHS from an NWS certified rain gauge was 2.25". Fortunately, the thunder diminished significantly before arriving in our area. Friday night poses the most serious risk yet this spring. A very strong weather system, with a rapidly-developing surface low pressure that will move just to our north, will traverse the region. By afternoon, we'll be firmly in the grips of the system's warm sector, which means high humidity, incerasing wind, and unstable air. As the jet stream moves over the Mid-South late Friday, thunderstorms will break out and could rapidly become severe by late Friday afternoon. Due to expected wind shear and very buoyant air, some of these storms could become supercellular and produce tornadoes and large hail. As the strong cold front moves through overnight, a squall line will likely form along or just ahead of it, bringing the threat of damaging wind as well. The map below highlights the area that the Storm Prediction Center thinks at this time has the potential for severe weather. The hatched area reflects the greatest likelihood. We'll continue to monitor the situation at MemphisWeather.net and provide updates throughout, via this blog and the MWN Forecast. Now would be a good time to sign up to receive FREE email messages to your PDA or email account if and when severe weather strikes. And you're in luck - MWN has just such a service - it's fast, it's accurate, and it's free! Sign up here. The Storm Prediction Center has dropped the Severe Thunderstorm Watch that was in effect for eastern Arkansas and portions of Missouri. In fact, the line of thunderstorms that was moving into the Mid-South has diminished in intensity significantly and there is hardly any lightning even left at 7:30pm. Continuous rain, some potentially heavy, will continue to move into the region over the next few hours, however. Look for about an inch of rain, with some locations picking up a couple of inches before it tapers off late tonight. 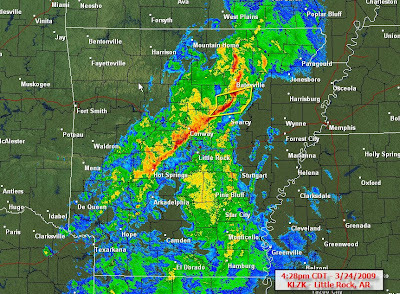 A potent cold front is moving into the region this evening, bringing with it a thunderstorm squall line which currently stretches through central AR, as evidenced by the radar image below taken at about 4:30pm. The Memphis metro area is under a SLIGHT RISK of severe weather for tonight (see outlook area at top) for the threat of some damaging wind gusts and maybe large hail. As this squall line approaches the river late this evening, it will begin to weaken, but some severe reports will still be possible in counties near the river in TN and AR. A Severe Thunderstorm Watch is in effect for northeast Arkansas and parts of Missouri until 9pm CDT. Most of the heavy weather will pass through before midnight, with rain tapering off before daybreak. Some locations could also see high rain totals from this system - in the 1-2" range. Wednesday will mainly be a dry day with a fair amount of sunshine in the wake of the cold front. Another system will move to our south Wednesday night, bringing another good chance of rain to the region. Once again, Thursday will be dry, followed by more rain and t'storms chances Thursday night. These chances will linger into Friday and Saturday, with another potential round of severe weather on Friday night. More on that to come... Stay with MemphisWeather.net for the latest on potential severe weather, as well as the most accurate forecast for Memphis! Three separate systems look to be taking aim on portions of the Mid-South this week, providing for a very unsettled pattern that will be wet at a minimum (this week's precip potential shown above) and possibly stormy. The first of these weather trouble-makers will arrive late Tuesday in the form of a cold front that will be bringing severe weather, including tornadoes, to the Plains later today. While severe weather is not necessarily expected in the Mid-South, there is a borderline SLIGHT RISK posted for east AR, as well as counties bordering the MS River in west TN and northwest MS for Tuesday afternoon and night and for parts of north MS on Wednesday. This front will definitely be bringing a fair amount of rain and some thunderstorms late Tuesday afternoon through Tuesday night, while strong gusty wind will precede the front. The front stalls to our south on Wednesday so much of the metro area will likely be dry that day. However, Wednesday night will see a swift-moving upper-level low move along the front, bringing another chance of rain. The front then pulls north as a warm front Thursday with the possibility of rain continuing. Once again in an unseasonably warm and unstable airmass behind the warm front, another round of possible severe weather arrives late in the week. Models are still having some trouble distinguishing the characteristics and timing of this system, so stay tuned for more details. Just in time for spring and severe weather season, an upgrade to one of MWN's features - WXLIVE! Severe Weather - has taken place. Visit the severe weather notification page of MWN to subscribe to receive e-mail weather warnings to your e-mail account or e-mail enabled PDA. Now, you can sign up on a county-by-county basis and only receive information for the county where YOU live or work. As fast as any other publicly-available service of its kind, the best part of it is it's FREE! If you or your company would be interested in sponsoring this service, feel free to drop me an e-mail! I like to keep MemphisWeather.net free for all users. New poll posted on the MWN Blog! A new poll has been posted on the MWN Blog (blog.memphisweather.net). Look in the right-hand margin and tell me how you currently get your weather warnings. Is it by TV or radio, a NOAA Weather Radio, the internet, or do you have them delivered to you by email or text message? Hey we're still a democratic society - take a minute to vote by March 26 and you'll have my eternal gratitude! Poll results will be posted a week from today. Today is the official first day of spring, or the vernal equinox. Welcome to Spring! Though "equinox" connotes an equal amount of day and night, that is not exactly so for Memphis at 35 degrees north latitude. The actual time of the equinox is 6:44am, when the sun passes directly over the Equator. Sunrise in Memphis is at 7:03am and sunset at 7:12pm. Thus, the length of the day is 12 hrs., 9 min.! Memphis actually experienced an equal amount of day and night 4 days ago, on March 16, when the sun rose at 7:09am and set at 7:09pm. Pretty cool, huh? So, for the first day of spring, we're looking for an absolutely gorgeous day with temps right at normal in the mid 60s. A small rain chance shows up Saturday but temps should remain near normal through then before starting to rise to slightly above normal levels to end the weekend and start next week. The next major frontal system won't affect the area until Tuesday or Wednesday of next week. It's been a while since I've posted, so it's probably a good idea to highlight the week's weather events. Rainy, cloudy weather hung around throughout the weekend and early in the week. With the ground saturated, very little evaporation occurring due to the clouds, and warmer temperatures arriving, we ended up with dense fog Tuesday morning that lowered visibilities to near zero in many locales. The fog held temperatures back from reaching their full potential yesterday, but we still ended up with highs near 70. Without the foggy start in most places, sunny skies and southerly wind should help temps warm rapidly from morning lows in the 40s into the mid 70s by late afternoon. The later sunset time will help keep the the evening very pleasant as well. A cold front will move through very early tomorrow, bringing a slight chance of rain and mostly cloudy skies for Thursday. Temperatures will respond appropriately as highs top out in the lower to mid 60s. Skies will clear Thursday night and dry conditions will persist into early next week. Highs will climb slowly from the 60s into the lower 70s by early next week as well. The next chance of rain after Thursday will be next Tuesday/Wednesday. Enjoy a great Spring Break week and upcoming weekend! Winter Weather Advisory has been cancelled for Shelby, Fayette, and Crittenden Counties. Winter Storm Warning for Tipton County downgraded to Winter Weather Advisory until 10pm. Not a whole lot has changed as the morning has gone along today. In the Memphis metro area, precipitation has been predominatly rain, with some reports of freezing precip (mainly sleet and snow) in counties north of the city (MWN StormView Radar has it handled well). We got as low as 33 degrees in Bartlett this morning with plain Jane rain. Low-level warm air between 1-3,000 feet has saved us today! A look at MWN StormView Radar at 6:30am shows freezing rain just north of Memphis, though parts of Tipton County, while sleet and some snow is farther north, roughly north of a line from Paris to Dyersburg to Harrisburg, AR. Temps have pretty well leveled out and are only very slowly falling. It's 32.9 degrees in Bartlett at 6:35am with moderate rain. 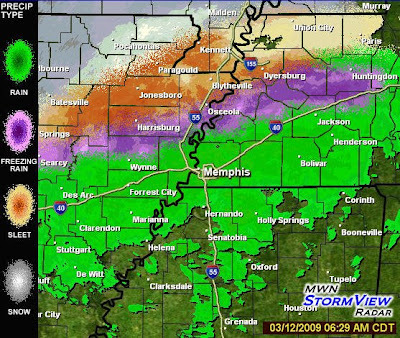 As of 6:35am CDT, Thursday, March 12, 2009, there are NO KNOWN school closings in the metro Memphis area. For a complete list of weather-related closings throughout the Mid-South, visit the WMC-TV closings page. The winter weather scenario appears to be playing out as expected so far. Rain is falling across the region with temperatures dropping right on cue. The NWS has upgraded the Winter Weather Advisory for Tipton and Crittenden Counties to a Winter Storm Warning, while Shelby and Fayette Counties continue under that Winter Weather Advisory. The upgrade for Crittenden and Tipton (as well as points just north, east and west of those counties) is due to the expected accumulations of snow and sleet. Up to 3" is expected in the warned areas. For northern Shelby and Fayette Counties, I look for more sleet and freezing rain to mix with the rain in the next few hours, with possible accumulations to 0.10-0.20" of ice. Southern portions of these counties will likely not see quite that much ice, and north MS will see little if any sleet. Further updates will be posted as necessary. Be sure to visit MWN for the current conditions, forecast, storm warnings, and MWN StormView Radar with winter mode. Just got off a conference call with the National Weather Service in Memphis. The Winter Storm Watch will be changed to a Winter Weather Advisory for Shelby, Tipton, and Crittenden counties (including West Memphis, Memphis and suburbs, Covington, and Munford) and will be in effect from 4am-10pm Thursday. A Winter Weather Advisory will also be in effect for Fayette County (including Somerville and Oakland) from 7am Thursday to 1am Friday. The Winter Storm Watch for DeSoto County (including Southaven and Olive Branch) will be cancelled. An updated Mid-South Warnings map will be available after the advisories are issued. This will definitely be a borderline case for the city of Memphis as the freezing line (32 degrees at the surface) is expected to be right along I-40 by mid-morning. Temperatures prior to that will be above freezing, and temperatures throughout the remainder of the day will remain in the 32-34 range. Precipitation will move into the area before dawn as rain, helping to cool the temps down as it falls. A warm (above freezing) layer of air will exist above the surface, causing precipitation to melt as it falls. However, near the surface, sub-freezing air will help to re-freeze at least some of the precipitation. 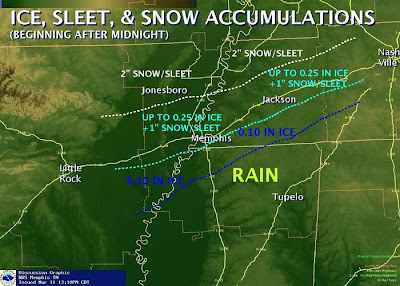 Therefore, for Memphis, I expect rain to start mixing with sleet sometime around the morning rush-hour (7-9am). After 9am, we will likely be seeing more sleet, and possibly freezing rain (ice), than rain. Precipitation should begin to taper off around lunchtime or early afternoon and could become a light snow/sleet mixture at that time. See the NWS graphic above for the expected precipitation types and amounts. Accumulations are expected to be perhaps as much as 0.2" of ice in the northern parts of the metro area, while southern areas may be half that. Up to an inch of snow and sleet is possible on top of the ice during the late morning through afternoon hours. Roads will initially start off OK due to recent warm temperatures, but in locations that see moderate freezing precipitation, bridges, overpasses, and secondary roads could become slick by mid-day. Links to road conditions are available in the sidebar of this blog. I will update this as necessary throughout the event and, of course, you can check the MWN Forecast for more information at any time. As I have done in the past, I will also attempt to post any metro school closings on this blog. Now here's a type of weather we don't see around these parts! Embedded below is a clip taken from a cell-phone video camera by a person in a high-rise office building as a major dust storm blows into the capital city of Riyadh, Saudi Arabia. Pretty amazing! It is not a time-lapse, so the dust actually envelopes the city that fast. Visibility was reduced to about 500 meters (about 1650 feet, or 1/3 mile) and the city was said to have taken on an orange hue, which is evident in the second video below. For reference, the skyscraper in the first video is the Al Faisaliyah Center, which according to Wikipedia is 267 meters tall (875 feet, 44 stories). A COLD FRONT WILL CONTINUE PUSHING SOUTH TODAY. THE FRONT WILL EVENTUALLY STALL ALONG THE GULF COAST AS AN AREA OF LOW PRESSURE DEVELOPS ALONG THE FRONT TONIGHT INTO THURSDAY. THIS WILL SPREAD MOISTURE NORTHWARD INTO THE MIDSOUTH. COLD ARCTIC AIR WILL FILTER INTO THE MIDSOUTH TODAY BEHIND THE FRONT. THE COMBINATION OF THE COLD AIR AND MOISTURE FROM THE LOW PRESSURE SYSTEM ALONG THE GULF COAST WILL PRODUCE WINTER PRECIPITATION OVER MUCH OF THE MIDSOUTH BEGINNING LATE TONIGHT CONTINUING INTO THURSDAY. THE NATIONAL WEATHER SERVICE IN MEMPHIS HAS ISSUED A WINTER STORM WATCH WHICH IS IN EFFECT FROM LATE TONIGHT THROUGH THURSDAY EVENING. RAIN WILL BEGIN LATE THIS EVENING ACROSS EAST-CENTRAL ARKANSAS AND SOUTHWEST TENNESSEE. RAIN WILL CHANGE OVER TO FREEZING RAIN OR SLEET SHORTLY BEFORE SUNRISE. FREEZING RAIN OR SLEET WILL CONTINUE TO OCCUR THROUGH THE MORNING INTO THE AFTERNOON. A CHANGEOVER TO SNOW COULD OCCUR IN AREAS NORTH OF INTERSTATE 40. ICE ACCUMULATIONS WILL LIKELY BE AROUND A QUARTER OF AN INCH. ONE TO TWO INCHES OF SLEET OR SNOW ACCUMULATION IS EXPECTED. A WINTER STORM WATCH MEANS THERE IS A POTENTIAL FOR SIGNIFICANT SNOW...SLEET...OR ICE ACCUMULATIONS THAT MAY IMPACT TRAVEL.CONTINUE TO MONITOR THE LATEST FORECASTS. THE NATIONAL WEATHER SERVICE IN MEMPHIS HAS ISSUED A WINTER WEATHER ADVISORY FOR FREEZING RAIN...WHICH IS IN EFFECT FROM 4 AM TO 7 PM CDT THURSDAY. RAIN WILL BEGIN TO SPREAD NORTHWARD INTO PORTIONS OF EAST ARKANSAS AND EXTREME NORTHWEST MISSISSIPPI LATE THIS EVENING. RAIN WILL CHANGE OVER TO FREEZING RAIN DURING THE EARLY MORNING HOURS AS TEMPERATURES DROP TO 32 DEGREES. THE FREEZING RAIN WILL CONTINUE DURING THE DAY ON THURSDAY AS TEMPERATURES HOVER AROUND THE FREEZING MARK. ICE ACCUMULATIONS AROUND A TENTH OF AN INCH CAN BE EXPECTED IN THE ADVISORY AREA. CLICK A WINTER WEATHER ADVISORY MEANS THAT PERIODS OF SNOW...SLEET...OR FREEZING RAIN WILL CAUSE TRAVEL DIFFICULTIES. BEPREPARED FOR SLIPPERY ROADS AND LIMITED VISIBILITIES AND USE CAUTION WHILE DRIVING. T'storms to be followed by COLD! It's hard to know how used to something you get until it is taken away. Trust me, you've gotten used to the 70-80 degree temperatures, and you'll be finding out over the next few days just how used to it you are! A strong early spring cold front is approaching tonight, accompanied by a line of showers and thunderstorms. Nothing severe is expected from this line as it moves into the Memphis area after midnight. Rain will linger through the morning hours Wednesday, but the main feature of this front is the cold temperatures just behind it. Tomorrow afternoon will see temps some 35 degrees colder than the past few afternoons!! The front will stall out well to our south and sit across the Gulf Coast states, while the jet stream level winds will continue to blow from the southwest. This will set the stage for a very interesting forecast for the next few days as upper-level impulses move along and behind the front with the upper-level wind. The first one of these arrives Thursday morning, bringing a round of precipitation. I believe that in the Memphis area, and along the I-40 corridor, we'll be right on the edge of possible wintry precip. Models today have been vascillating between light rain, snow, and sleet for Thursday morning. Hopefully I'll have a better feeling about it tomorrow, but given that this is almost mid-March in Memphis I'm betting that we won't know exactly what we'll get until it actually arrives. For now, my forecast carries a chance of a wintry mix. The first impulse should move out by Thursday afternoon, but another could arrive on Friday. Once again, morning temperatures could be critical and I can't rule out another chance of a wintry mix as lows look to again be in the low to mid 30s. Though this scenario will play out with a stronger low on Saturday, I do think we'll finally be warm enough to support all rain this time around, so Saturday looks wet and cool right now. Highs in the 40s is the best we will do until at least Saturday, so bundle up, bring the umbrella, and keep the ice scraper handy, JUST IN CASE. ;-) I'll update this blog as conditions warrant. The surface map above shows the position of the stalled out front that moved through the Memphis area last evening, sparking rain showers for some. The front is very obvious when looking at dewpoint temperatures (green numbers - a dierct measure of moisture content in the air) and wind direction (black barbs) on the map. At 11am in Memphis, the temperature had risen nicely to the upper 60s after a cooler morning, which is not too much cooler than areas south of the front. However, the dewpoint is near 40 (the 40 degree dewpoint line, or isodrosotherm, is drawn in blue on the map), while just south of us in Tunica, it's in the lower 60s! Tunica is in the warm, moist Gulf air, which is being blocked from the metro area by the front. Also notice that wind north of the front is generally out of the east, while it's out of the south on the south side of the front. This front will lift north this afternoon and we will see our dewpoints rise quickly back to near 60 by this evening. Temperatures will not be affected as much by the frontal passage, as the colder air remains further behind the front, well to our north. Dry conditions (outside of possibly an isolated shower along the front this afternoon) will persist through tonight and probably most of tomorrow before our next chance of rain and thunderstorms moves in with another front. P.S. As a side note, no temperature records were broken yesterday or today at Memphis International. The temperature dropped below 65 (the current record) before midnight last night following the cold frontal passage, so the daily low temp did not set a maximum low for the day. The first cold front is moving through the region this evening. The position of the front as of 8pm is shown above. A few showers (some with brief heavy rain) are firing just ahead of the front, but most locations are staying dry as the best dynamics move north resulting in the stronger storms staying well to our north as well. The showers are falling parallel to and just south of I-40 between Memphis and Jackson (MWN StormView Radar image from just after 8:00pm below). As these showers move east, I don't expect to see much more in the way of precipitation for the rest of the night in the metro area. The front is followed by cooler and much drier air, though it won't move far enough south of the city for us to see too much of that cool dry air. Overnight lows will be about 10 degrees cooler than last night, but still in the mid 50s. Tomorrow will see highs rebound again into the mid 70s as the front pulls back to our north as a warm front. A couple more spring days left before a touch of winter sets back in! We started off the day with a record high minimum temperature at Memphis International Airport (provided we don't drop below 65 prior to midnight tonight). 67 degrees was the morning low; the previous record was 65 set in 1974. Temperatures will remain in the 70s for highs through Tuesday before a strong late-winter cold front moves through Tuesday night. I expect to see another record high minimum set tomorrow morning (the current record is 62 set last in 2000). Prior to the arrival of that "real" cold front, a weaker front will move into the region this evening and briefly stall out just south of Memphis early Monday before returning north as a warm front Monday evening. This will set the stage for the stronger push of cold air Tuesday night. As the front pushes in later this afternoon, there will likely be a broken line of showers and storms accompanying it. Many areas may remain rain-free, though areas that see storms will see heavy rain and lightning, gusty wind (gustier than we've already had the past few days! ), and possibly small hail. I don't expect to see many storms become severe, if any at all, though some could be strong (link to MWN StormView Radar). Monday and Monday night will be primarily dry and continued warm, and also less windy than the past few days. Tuesday will see a return to higher humidity, windy conditions, and very warm weather (upper 70s, which is just a couple degrees below the record high of 82). By late in the day Tuesday, I expect a possible squall line to move into western parts of the Mid-South and continue through the region overnight Tuesday night. This will be our best chance of thunderstorms for the entire area in the next 7 days. I'll continue to monitor it and keep you abreast of any possible severe weather. A slight risk area is possible for Tuesday night for our region. Wednesday will begin the next cold spell and it will unfortunately feel REAL cold following this wonderful spell of 70-degree weather. Besides the cold, it unfortunately could be wet as well with southwest flow aloft overrunning cold northerly wind at the surface. We'll keep our fingers crossed that the surface temps don't get TOO cold and we don't end up with any freezing precip. Check out the MWN forecast for the latest on our wild weather week ahead! The last couple of days have made last weekend's snow storm seem like a distant memory. While the snow lasted for 3-4 days in many areas, temps recovered into the 70s by yesterday and overnight lows well above freezing put an end to any remnants of the snow cover. This 70-degree-plus spring-like weather pattern will continue through the weekend and into the first half of next week, though it will get wetter as we end the weekend. In addition, low pressure over the plains and strong high pressure over the southeast will combine to set up a pretty good pressure gradient, creating windy conditions. By Sunday, a front to our west will sneak into the Mid-South and bring us a chance of thunderstorms Sunday afternoon after the possibility of morning showers. The Storm Prediction Center has parts of the area (mainly north of Memphis) in a SLIGHT RISK for severe weather Sunday and Sunday night. I'll keep an eye on it, but it appears that risk is fairly low at this time, particularly for the metro area. A map of the risk area is below. The front will stall in our region, bringing a continued chance of rain and possibly thunderstorms Monday and Tuesday as the front makes one more push through the area. It could once again stall just to our south on Wednesday with models calling for the chance of a low pressure system to move along the front bringing us more rain! All in all, it appears that our well above normal temperatures may result in plenty of rain Sunday through Wednesday or Thursday. 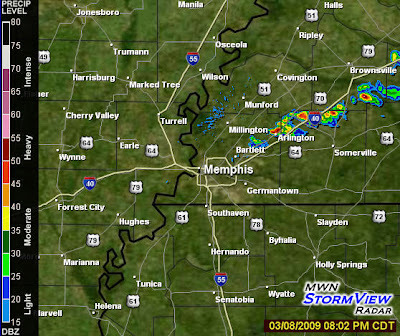 For my complete forecast, visit the MWN Forecast on MemphisWeather.net. My accuracy statistics for the month of February are finalized and posted on MWN. Thanks to a strong bit of forecasting to end the month, I edged out the National Weather Service and all three computer models to take first prize for temperature accuracy. All sources improved slightly over the month of January. I don't post dewpoint accuracy stats on my website, but I also led the pack there as well. Since I started writing forecasts for Memphis and keeping forecast accuracy statistics in January 1998 (hard to believe I'm into my 12th year! ), my temperature forecasts have placed 1st or 2nd EVERY month except March 1999 and June 2006 (98.6% of the time) and I've beaten all other sources on a monthly average 88.9% of the time. Fore more details, visit my forecast accuracy page. Or, for today's "most accurate publicly-available forecast for the city of Memphis," click here! On a separate note, accuracy stats for the Nested Grid Model (NGM) will no longer be available as that particular model's run of service ended on March 2. It had fallen behind the times technologically and was generally bringing up the rear as far as accuracy was concerned, as enhancements were being directed the past several years to the NAM and GFS. Farewell, NGM! February wrap-up and March warm-up! The February statistics have been compiled and Memphis officially ended up warmer and drier than an average February. Here is the monthly recap from the NWS. The average temperature was 47.9 degrees, which was a whopping 3.0 degrees above normal! The highest temp for the month was 74 degrees on the 18th and the lowest was 21, on the 4th and 5th. Precipitation totaled 3.26", which is a little more than an inch below normal. There were 11 days it dropped to or below freezing, 2 below normal. The 3.0" of snow officially measured on 2/28 brings our seasonal total to 3.8". In Bartlett, WXLIVE! recorded an average temperature was 46.6 degrees, a max of 73.5 on the 18th and a min of 17.3 degrees on the 5th. Precipitation totaled 2.22", though some of the recorded precipitation on 3/1 of 0.62" was snow that fell on the 28th and was recorded on the 1st. Total snowfall for the month was 8.9" - which includes snow that fell in the wee morning hours on the 1st. As for the rest of the "first week of spring," it will definitely start to feel more spring-like! After one more cold day today, the jetstream will begin lifting to the north, signaling a pattern shift for the southeast U.S. Warmer high pressure takes control, wind shifts to the south by Wednesday, and highs jump back up to 70+ by Thursday. More details can be found in the MWN Forecast. As of 10pm Sunday evening (March 1), the following school districts around the Memphis metropolitan area have announced that they will be closed on Monday, March 2: Fayette County, Fayette Academy, Tipton County, and Tipton-Rosemark Academy. In addition, Jackson/Madison County Schools will be closed. Memphis City Schools, Shelby County Schools, and DeSoto County Schools have announced that they will be OPEN on Monday. A full list of closings can be found on WMC-TV's website (link here or see the link in the blog links to the right). Here is a map showing the snowfall totals as received by various sources. Feel free to send me your amounts! The temp is nearing the freezing mark and melting has commenced at WXLIVE! sensors. Rainfall totals are increasing but only because of melting. Will try and empty snow from bucket and reset rain amount. 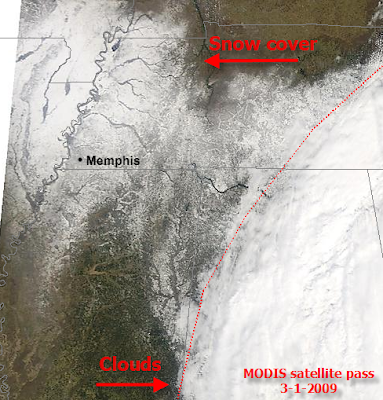 Above you'll see an image taken by the MODIS instrumentation aboard a Terra satellite (a Polar-Orbiting satellite) as it took it's morning pass over the Mid-South this morning. The snow and clouds are marked, delineated roughly by the dotted red line. The brighter whites over the Mid-South are deeper snowpack, and one can clearly see rivers and large streams (darker lines snaking through the snow) that aren't snow-covered. The resolution of this particular imagery is excellent (1 km). If you wanted to know who got snow, this is the best way to see it! Another image from the GOES-East satellite (VIS channel) is shown on my friend Eddie's blog. March comes in like a... polar bear? What a storm! I'll be gathering some final snowfall totals and summarizing here later on today, but it appears that this was indeed a record-breaking and historic event that took place across west TN and northeast AR. The official recording station at Memphis International only ended up with 3.0", but there was definitely a couple of heavy bands that set up along and north of I-40 during the afternoon and again overnight. The heaviest hit locations appear to be along that corridor. My total ended up being 8.9". I've posted some pics below, taken this morning. Look for another post later today.